Theodore Fulton "Ted" Stevens, Sr. (November 18, 1923 – August 9, 2010) was a Republican U.S. Senator from Alaska. He served in the United States Senate for 40 years from 1968 to 2009. He was the third President Pro Tempore of the Senate from 2003-2007. For his services as President pro tempore, Senator Stevens was named President pro tempore emeritus of the United States Senate. Even by Senate standards, Stevens was extremely effective at getting billions of dollars in federal funds for Alaska. He was so effective at it he was nicknamed "uncle Ted". The airport in Anchorage, Ted Stevens Anchorage International Airport was named after him in 2000. Stevens was born in Indianapolis. In 2010, Stevens died in a plane crash in Alaska at the age of 86. Stevens was born on November 18, 1923 in Indianapolis, Indiana. In World War II Stevens joined the US Army Air Corps as a pilot. He flew transport planes in China supporting the Flying Tigers. He was awarded two Distinguished Flying Crosses, two Air Medals and the Yun Hai Medal by the Republic of China. After serving in the Second World War, he went into law in Fairbanks, Alaska where he became a US Attorney soon after. When Dwight Eisenhower was President, Stevens worked in the Interior and helped to make Alaska a state. In 1968 he was appointed to the Senate, where he served for the next forty years. While in the Senate he was known for taking action for his own state: preserving Alaskan wilderness areas, protecting fisheries, and building the Trans Alaska Pipeline. He also helped set up the US Olympic Committee. In 2008 he was charged with major crimes related to corruption days before his reelection, which he lost to Mark Begich. He planned on trying to get his Senate seat back after he the charges were dropped, but he died in a plane crash in the Alaskan wilderness in 2010. ↑ 1.0 1.1 1.2 "STEVENS, Theodore Fulton (Ted), (1923 - 2010)". United States Congress. Retrieved 26 January 2015. ↑ 3.0 3.1 Richard Adams (10 August 2010). 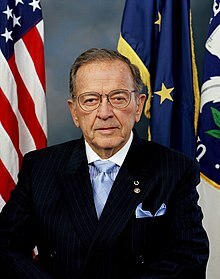 "Ted Stevens: Alaska's stalwart uncle". The Guardian. Retrieved 26 January 2015. ↑ "Former Sen. Stevens killed in plane crash". KTUU.com. 2010-08-10. Retrieved 2010-12-01. ↑ Katharine Q. Seelye (10 August 2010). "Ted Stevens, Politicians and Planes". New York Times. Retrieved 26 January 2015. This page was last changed on 23 April 2019, at 12:34.